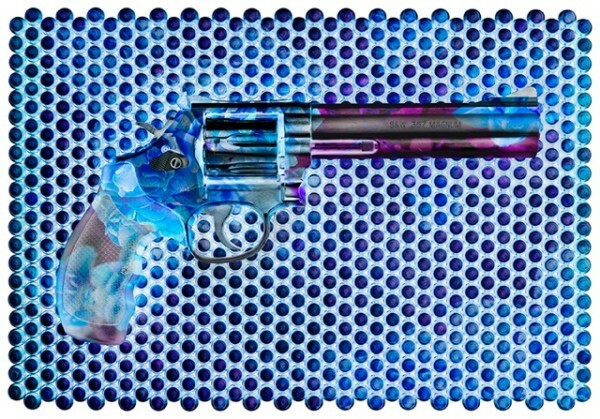 Jon Rouse has expressed his life long passion for working with sculpture, photography, lithography and painting through his latest opus, a study and re-imaging of rare firearms, ammunitions and explosives. Rouse’s unique style has led him to photograph many celebrities, including recording artists, Michael Jackson and John Legend, celebrity Chefs Gordon Ramsey, Kerry Simon and Wolfgang Puck, and hundreds of models, including Cindy Crawford, and the current Miss USA, Nia Sanchez. As a world renowned photographer Jon has photographed in more than 80 countries and his photographs have appeared in hundreds of magazines, including Architectural Digest, Touring and Tasting, Spa Magazine. and Resorts and Great Hotels. Following in the footsteps of his father, Jon has built fine furniture and used his artistic flare in his show PRIMER by creating furniture pieces, including a coffee table encircled with live ammunition. Armed with the highest resolution camera available, contemporary artist JON ROUSE has succeeded at creating masterpieces of our time. ROUSE has mastered the artistic and technological skills over decades to unlock the boundaries to embrace a subject matter rarely showcased in contemporary fine art. As a master of visualization, artistic visual technology, and illumination, ROUSE has elevated photographic artistry with his collection PRIMER: An Explosive Study Of Weaponry. ROUSE uses a highly technical photographic macro alignment process that bundles fine layers of resolution to achieve the finest detail of each and every subject he marquees. Color and contrast leap out from these dramatically limited originals through a precise specialized lithographic process thus allowing an injection of deeper more vibrant colors onto ROUSE featured subject matter. A prime example of the ROUSE process is the stunning Crimson MK II Grenade which is a massive original of greater than 3 Terabytes. That represents 3 Trillion Bytes of resolution within one ROUSE original. Final resolution so high that ROUSE works of art can often appear 3-Dimensional. A fact rarely witnessed in any contemporary fine art pieces of our day…and thus, taking months to complete each ROUSE original from concept to creation resulting in a clarity rarely seen in fine works of art of this size.